What makes a catchy wine label? When it comes to Bordeaux wine labels, what is going get you to pause and consider a $10-$20 bottle? While on a media trip visiting the region sponsored by Planet Bordeaux, one of the issues of discussion concerned wine labels and how to get people to pick up a bottle off the shelf. 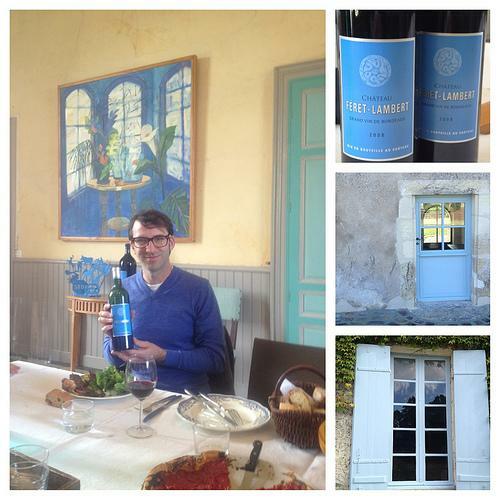 When I started feeling blue about the whole subject, it was the color rather than the emotion at Chateau Feret-Lambert. I couldn’t help but have a serendipitous feeling about my random decision to wear a blue sweater that day. There’s no quibbling with what’s inside the bottle. Refreshing white wines made from Sauvignon Blanc, Semillon, and often a touch of aromatic Muscadelle. The reds, labeled Bordeaux and Bordeaux Supérieur, were mostly Merlot-heavy and ranged from the fresh and friendly to the surprisingly cellar-worthy. Rosés, darker in color and more robust than I’m used to, were a refreshing change of pace. Stubborn red wine-drinkers might even enjoy Bordeaux Clairet. It’s kind of like a super-rosé. What follows is a look at some Bordeaux wine labels of interest (along with a couple cool packages and thirst-quenchers) that caught my eye. Which do you find most appealing?